Staying connected with learners after the completion of their eLearning courses is a challenge that most training and corporate companies are facing nowadays. Basically, learning doesn’t stop with the completion of these courses, and you do stand a chance to leave a long-lasting impression on your learners by keeping them engaged even after their courses are over. In this article, we present to you eight interesting ways to engage learners after completion of their eLearning course and turn them into your lifelong learners. Offering follow-up courses to learners who are self-starters and driven by the idea of gaining knowledge from all directions work a great deal in keeping them connected for upcoming or future courses. These follow-up courses allow them to develop skills and improve their proficiency at their own pace. A learning management system makes it easier for you to recommend such courses to the right set of learners. LMS reports can also help you monitor their progress from time to time and thereby, enable you to provide relevant solutions like certifications to help learners move on with the courses. Hosting live events are a great way of making direct interaction happen with learners. Conducting live question and answer sessions will help them in clearing their doubts and facilitate the exchange of knowledge in real-time. Also, recording these sessions can be fruitful to help learners who couldn’t make it to the live event. Synchronizing these sessions or events with your social media pages enables learners to stay connected and informed., not only about ongoing events/sessions but also about upcoming courses. Creating exclusive social media groups for learners is highly beneficial to spark online conversations and discussions related to the courses. It provides a platform for learners to exchange valuable resource links, information, and share peer-based feedback. Learners love to get certified for the skills they develop and knowledge they gain through eLearning courses and training programs. Online certification courses give importance to practical skills, tasks, and topics that help learners to appear for the exam and receive certificates that can aid them in their career path. Hence, offering these self-paced certification courses based on learners’ objectives can help you engage with them. It keeps your brand name fresh in their minds. Sending out monthly newsletters to your learners keeps them informed about ongoing and upcoming courses. Through this, you can also initiate new topics for discussion that can engage learners. One important thing to keep in mind here is to ensure that it inspires learners and offers them valuable inputs or content. 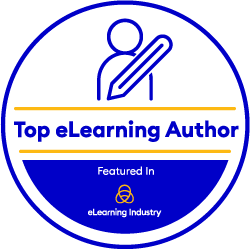 Having special newsletters from Subject Matter Experts can be of great value for learners and will provide them with engaging and interesting content. However, newsletter emails should also allow learners to opt out of the newsletter subscription as you would not want to force them into taking interest in your learning updates. Learners want to know that they are heard and their inputs and opinions are valued. Online learners are more likely to engage when you request for their feedback and give importance to their opinions. Conducting surveys and sharing questionnaires are a just a few ways to gather feedback from online learners. Inviting learners to participate in online discussions for the development of upcoming learning courses can also be an effective way of collecting feedback. This will allow you to understand the areas that need improvement and thereby, enhance the quality of content and learning experiences delivered to learners. Video series that cover new topics every month can generate interest among learners to follow your channel. Uploading or linking these videos on your website can help you reach your target audience and attract new learners along with keeping the existing learners engaged. Adding schedule details on the website for the next video or podcast can further attract new learners and improve engagement. These are some of the effective ways to inspire, engage, and interact with online learners. They will also help you in attracting new learners and keep their interests alive for upcoming eLearning courses and endeavours. To know more about how we, at eNyota Learning, build courses to drive learner engagement for our clients, feel free to connect with us today!